The new Star Trek flick just came out. While nobody we know will admit to seeing it, the reviews sound pretty good. That said, the most famous Trekkie soundbite will always be the anti-Montalban "KHAAAAN!" 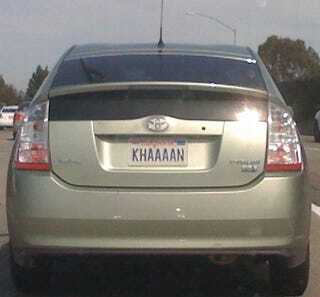 We ran the numbers and there's about a 3% chance this is actually William Shatner's Prius, though it's much more likely the ward of a comic book guy-like gentleman who wears latex Spok ears to his IT admin job. In case you aren't familiar with the source material this license plate is referencing, we've included the famous clip, from Star Trek II: The Wrath of Khan. Live long and prosper.